blueprint.tv has today launched their first independently produced iPad and iPhone App. “My First 101 Words” is a fun, interactive and educational app aimed at teaching toddlers and others their first words in English through the use of video. The app is fronted by a boy called Abe and a girl called Myrelle who take the user through a series of videos teaching different words. Each word is demonstrated with an appropriate action or object and the words are then spoken by Abe or Myrelle. The word is repeated in a voiceover as the word appears written on the screen. Video was chosen as the medium for delivery because the existing apps based around this topic are either stills or animation based (and therefore inaccurate or confusing for children) and use an American accent (and are therefore not relevant for the average British or European parent). The 101 words for the app have been carefully selected to include nouns and verbs commonly found in resources supporting pre-school speech and language development. Each one is either an object or action which can be represented accurately and appropriately through the medium of video. Patrick Jackson, bestselling children’s author at the Oxford University Press, said: "This is exactly how we should be using this amazing new technology. 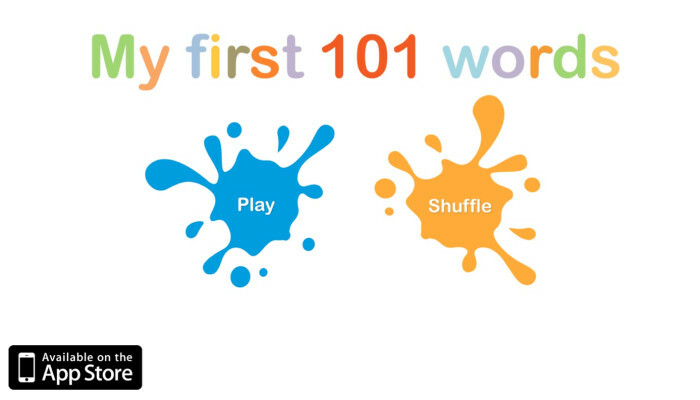 ‘My First 101 Words’ will entertain, educate and give children that all important feeling of exploration. Perfect for little ones." The app was built in association with Menthe et Grenadine, a company specialising in classically timeless children shoes, and Patrick Jackson, a bestselling author interested in how real world connections motivate children to learn language.